To ensure an ergonomic, neutral relaxed posture in your hands, you need a mouse which fits your hand perfectly, which is exactly what the Perfit Mouse Optical does (a Perfect Fit). This mouse supports your hand and wrist, keeping it elevated above the worksurface without restricting circulation, and eliminating the need to 'grip' the mouse. The buttons are longer than traditional mice, allowing you to click with the base of your finger instead of the tip, without having to curl your fingers, which helps to prevent trigger finger. The vertical scroll wheel is on the side of the mouse on a horizontal axis, making scrolling easier to accomplish. 5 reprogrammable buttons (3 on top and a two-way rocker switch on the side) allows you to customize your Perfit to your needs. The PMO5 series is also available by SPECIAL ORDER ONLY. NO 30 DAY CSG for those who preferred the 'classic' design and is identical with the exception of the removal of the vertical scroll wheel. 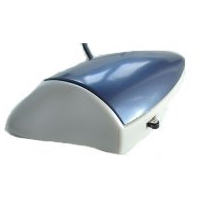 The VerticalMouse 3 is the third generation of the popular Evoluent mouse. A new feature added to Revision 2 of this mouse allows the user to set the resolution to 2600, 1800, 1300 or 800 DPI using a button and indicator light on the underside of the mouse. This makes adjusting pointer speed easier and further improves tracking - note the mouse is shipped with the resolution at 1800 DPI. The VerticalMouse 3 is now discontinued and out of stock. It has been replaced by the VerticalMouse 4. 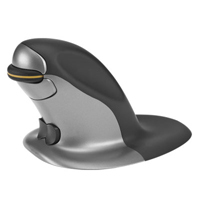 The Penguin Ambidextrous Vertical Mouse Wireless from Posturite allows the user to rest either hand comfortably alongside the vertical structure, encouraging the use of the gross motor muscles in the forearm and upper arm to manoeuvre the mouse. Fine cursor control can be achieved with small hand and/or finger movements. Its ambidextrous design and central ‘bow-tie’ switch allow for easy transition between right and left handed use. The weight of the hand resting on the base ensures easy movement and control of the mouse, reducing the need to "grip" the mouse and permitting the fingers to remain relaxed while still being in optimum position for clicking. Features include adjustable DPI (400, 600, 800, or 1200), a precision scroll wheel and silver-based antimicrobial coating. The Penguin Mouse is also available in a wired model. The MX Vertical Advanced Ergonomic Mouse from Logitech is their first attempt at offering a mouse which more aggressively reduces pronation than other mice in their line. The body of the MX Vertical is angled at a fixed 57° to reduce the risks associated with pronation of the forearm. The angled body is designed to provide the support necessary for the hand to "relax" while engaged with the mouse. However, those with smaller or narrower hands may find that they need to maintain a degree of tension to hold their hands "up" in position over the buttons. Large or wide hands will likely have less of a problem with this requirement to maintain hand position. The MX Vertical is equipped with a top quality sensor capable of reading from 400 - 4000 DPI. Two nominal settings of 1000 and 1600 DPI can be adjusted anywhere within the range in 50 DPI increments. The top-mounted DPI button enables users to adjust the mouse as needed for basic or fine control movements. 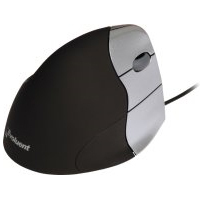 The scroll wheel has a rubber tire for grip and features distinct but soft detents. There are 4 programmable buttons (left, right, back, & forward). The MX Vertical offers 3 connection options: Wired via the charging cord, 2.4Ghz Logitech Unifying Receiver with an operation distance up to 33 feet, and Bluetooth (Bluetooth Low Energy Technology required). The 270mAh Li-Po rechargeable battery can provide up to 4 months use on a single charge and offers a 1 minute Quick Charge that can provide up to 3 hours of use. Of course, individual usage may affect this. Using Logitech "FLOW" users are able to connect to and control up to 3 computing devices using a single mouse. The "flatness" of the buttons on the MX Vertical prohibit the fingers from achieving a fully relaxed and naturally curved "position of function". This factor, combined with the almost slick surface on the buttons could lead users to try to "pinch" the mouse between the thumb and fingers in an attempt to achieve a better sensation of "control". In addition, to minimize the activation force on the buttons the fingertips need to be as close to the end of the buttons as possible. Those with large hands or very long fingers may be able to achieve this position but most users will find their fingertips falling short of this "optimum" position, resulting in a higher force being required for click activation. 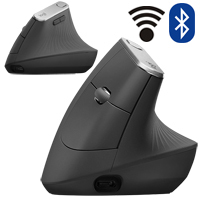 The R-GO HE Sport Ergonomic Bluetooth Mouse from R-GO Tools rotates the hand upward and outward. This angled posture reduces strain on the tissues of the forearm when compared with the traditional pronated "palm down" position. In addition, because the hand is now elevated up and away from the surface, users are no longer able to "plant" the heel of their hand in the manner that the traditional mouse position encourages. Thus, the potential for the development of RSI from repetitive or sustained wrist extension is virtually eliminated. The R-GO HE Sport Ergonomic Bluetooth Mouse offers support for the hand and fingers, encouraging users to let their hand relax against the natural contours. The R-GO HE Sport is sized to accommodate hand sizes ranging from 6.5" to 7.3" in length, is available in both Left and Right. It is equipped with a 4-level sensor that can read from 800-2400 DPI. 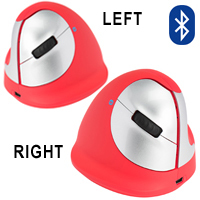 The R-GO HE Sport Ergonomic Bluetooth Mouse features a striking red body with contrasting silver buttons. The highly textured thumbrest ensures firm control but users with high sensitivity may find the braille-like nodules less than comfortable. Connectivity is via Bluetooth so this model will only connect with computers that are Bluetooth-enabled. For non-bluetooth environments there are both Wired and a 2.4 GHZ Wireless models available. The wired BREAK model provides also visual cues to remind users to take regular breaks in order to reduce the risk of developing RSI.